Although Starz Entertainment hasn’t mentioned when they plan to air the upcoming U.S.-produced season of Torchwood, there are rumblings that it could be July. In the meantime, former Buffy The Vampire Slayer producer (among other Whendonverse shows) Kelly Manners has signed on as a producer of Torchwood. So Captain Jack fans may still have several months to wait…if you need your John Barrowman fix, check out I’d Do Anything, the Andrew Lloyd Webber singing/talent competition airing on BBC America where he is a judge. Just don’t look it up on Wikipedia – its actually two and a half years old, and the article contains spoilers. At last! Here is a preview of the U.S. version of Being Human, which premieres on Syfy on January 17th at 9PM ET/8PM CT. 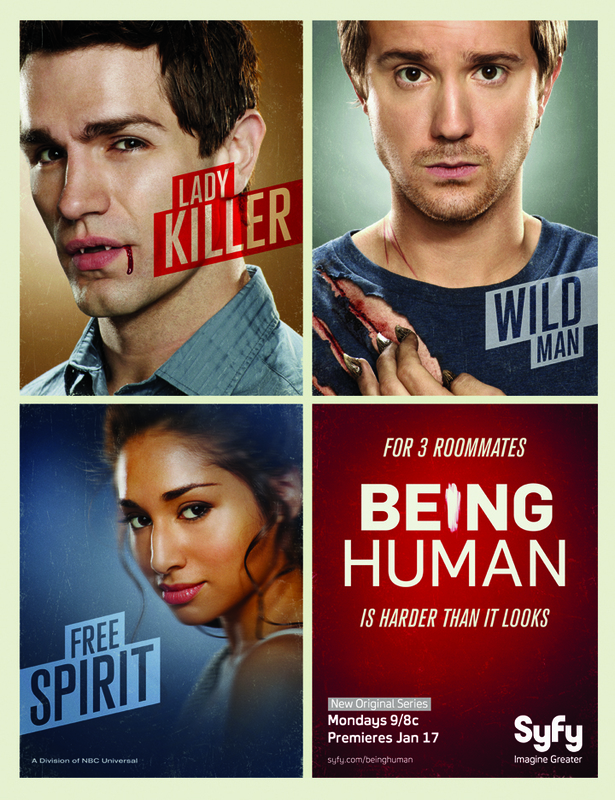 Being Human follows three paranormal roommates: a ghost (Meagan Rath), a vampire (Sam Witwer) and a werewolf (Sam Huntington) and their difficulties with living double lives. Got an email from Amazon this morning. Today only (November 30th), the Gold Box Deal Of The Day is Battlestar Galactica: The Complete Series. The Blu-ray is being offered at $119.99, and the DVD set is $80.99 – both at 60% off the list price. This is a great deal if you don’t already have it, or know someone who could use it as a Christmas gift! Marc Singer, who starred as Marc Donovan in the original V mini-series, will appear in the 10th and final episode of the second season of the rebooted V series on ABC. He is playing an all-new character by the name of Lars Tremont, a member of a top-secret global organization consisting of military and government officials who do not believe what the Visitors are saying. But seriously, Ice Quake airs on Syfy on Saturday, December 11th, at 9PM ET. Brendan Fehr (CSI Miami) and Victor Garber (Alias) are featured, and also has Sharon Taylor and Ryan Grantham from Riese: Kingdom Falling. Peter Jackson will be filming The Hobbit for 3D, and he will be doing it with the brand new RED EPIC camera, the successor to the successful RED One digital camera. The EPIC will have a “5k” resolution, which means the horizontal resolution will exceed 5,000 pixels (the EPIC is reportedly 5120×2700). By comparison, “1080p” for your standard HD TV is 1920×1080. This allows for better theater projection resolutions and also allows for limited digital zooming to reframe shots without re-shoots. The size of the EPIC makes it far more practical for 3D filming, where they have to mount two cameras together to get the stereoscopic view. Dual mounted Panavision cameras are quite heavy and bulky. Actor Leslie Neilsen, best known for his slapstick comedies but also famous in SF fandom for his serious turn as Commander J.J. Adams in the classic 1956 movie Forbidden Planet, passed away at the age of 84 due to complications from pneumonia, according to his family Sunday. Irvin Kershner, director of The Empire Strikes Back among various movies and TV series, has also passed away at the age of 87. Fifth Doctor Peter Davison will join former Tenth Doctor companion Freema Agyeman (Martha Jones) and Jamie Bamber (Lee Adama, Battlestar Galactica) on the cast of ITV’s Law & Order: UK, the British version of the long running NBC franchise. Davison will play Henry Sharpe, the new head of the CSP, during the upcoming fourth series now currently filming. Harry Potter and the Deathly Hallows, Part 2 will be released on July 15th, 2011. See the whole interview here.